COMPOSER Sean Ross with his nephew, Caleb McDonnell, at the workshop of Act Two of his opera in January 2017 and, below, as depicted by Melbourne artist, Paul McCluskey in 2001. 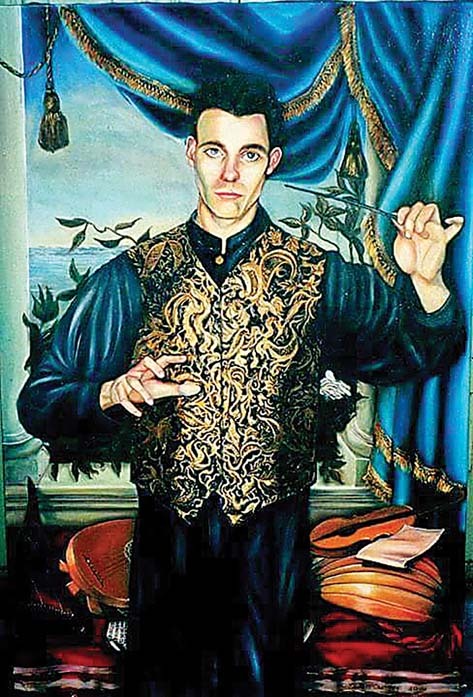 CLASSICAL musician, Sean Ross, echoes claims by the Spanish artist Salvador Dali that his art was influenced by memories from before he was born. 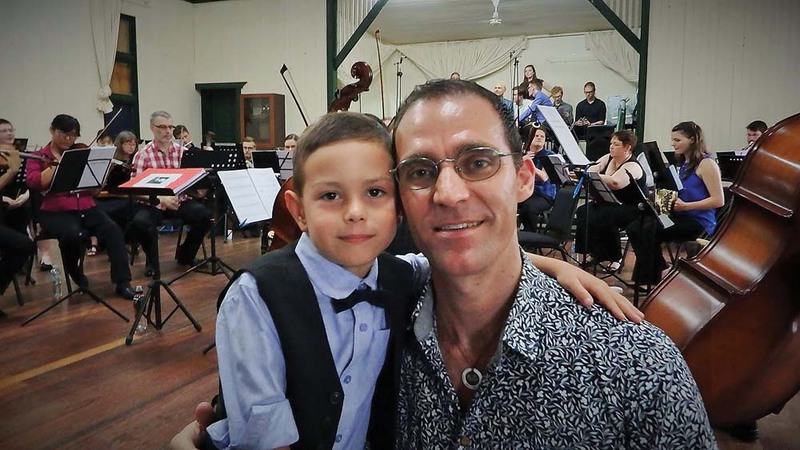 Part-raised in Frankston and a one-time boarder at Peninsula Grammar, Mt Eliza, Ross credits his then-pregnant mother’s playing of Tchaikovsky on a cassette player with his “destiny” to write an opera about the Russian composer’s life. “I truly believe my opera was conceived with me, in my mother’s womb, and that it was therefore my destiny to write it. I’d even go so far as to say it was written on the very blueprint of my soul,” he says. “Listening to Tchaikovsky’s music [when studying the composer at Melbourne University] was like remembering a language I had once spoken, long ago. Although a man whose work – composing, conducting an orchestra, or accompanying singers at the piano – is steeped in the classics, Ross is using very modern methods to raise money. Whereas in the past artists looked for a patron, they can now look to many sources for patronage, or audience sourcing. Ross’s efforts to raise money to pay for rehearsals and Melbourne concert performances of Act Three of his opera, Tchaikovsky, Angel of Music with the Royal Melbourne Philharmonic choir and orchestra, with Opera Australia soloists have ranged from radio interviews to Facebook, inserting flyers into concert programs and the online Australian Cultural Fund. Although Tchaikovsky, Angel of Music won the Director’s Choice Award for opera in the 2014 Boston International Contempo Festival, that is no guarantee of having it performed on an ongoing basis. “We have raised about one third of the money needed to finance the [$110,000] project, but need a further $40,000-50,000 by mid-year if we are to be able to go ahead and plan the rehearsals and performances for as early as March or April, 2019,” he told The News. Now based in Brisbane, Ross has “plastered a media release all over Facebook”, spoken on several radio programs and received endorsement from conductor and music director Andrew Wailes, who spoke at length about the Tchaikovsky to the audience at last August’s RMP Aria Final. A flyer about the project was included with the evening’s concert program. “A similar flyer was also included in the programs of audience members attending the RMP’s performance of Messiah last December, so the target audience has been targeted on several occasions,” Ross said. He is also anticipating article in a Melbourne daily newspaper “in the next month or two, which will no doubt help us enormously, in terms of generating wider publicity”. “I’m deeply flattered that Maestro Wailes has chosen to support my opera, for it means I’ll have at my disposal the combined forces of one of the finest musical ensembles in the country,” Ross says. “With the added interest from great singers including Guy Booth, Sally-Anne Russell, and Andrwew Jones, it would be such a shame if we weren’t able to raise sufficient funds in time to present the concerts in 2019. “Naturally, I’ve applied for numerous government and family foundation grants to date, … but, sadly, with very little success. Details: www.seanpeterross.com or donate at australianculturalfund.org.au, under Sean Ross’s opera’s name, Tchaikovsky, Angel of Music.